John has established a reputation in the areas of Criminal Law and Personal Injury* Law. He has practiced in all of the Criminal Court in Ireland, including the District Court, Circuit Court, Central Criminal Court, Court of Criminal Appeal and The Special Criminal Court. He has dealt with every type of Criminal Case including murder and other serious crime. He has built up a network of expert contacts in the practice of Criminal Law and is in a position to provide a most comprehensive service to clients in this area. 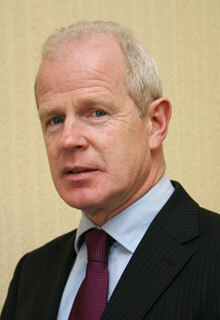 John also has an extensive Personal Injury* practiced in Clare, particularly in the Circuit Court. He acts exclusively on behalf of Plaintiffs pursuing claims. This practice covers Road Traffic Accidents, Slip and fall type accidents, and Work accidents. John in his spare time is an enthusiastic cyclist and has cycled around the entire country for charity. He still plays 5 a side with the same crew and only ‘retired’ from full time soccer at the age of 39. He coaches with Ennis RFC and is an avid gardener if he has any time left over after that. He is also involved in charitable work, travelling to Belarus annually to assist in the orphanages down towards Chernobyl. To his eternal embarrassment and the amusements of others he has recently danced and boxed to raise funds for local charities.